Before Mr. Darcy could respond, a chorus of screams filled the assembly hall, immediately joined by the shattering of window panes. Unmentionables scrambled in, their movements clumsy yet swift; their burial clothing in a range of untidiness. Guests who had the misfortune of standing near the windows were seized and feasted on at once. Elizabeth watched Mrs. Long struggle to free herself as two female dreadfuls bit into her head, cracking her skull like a walnut, and sending a shower of dark blood spouting as high as the chandeliers." Okay, I'm going to go watch my stolen movie again... Everybody have a good night! 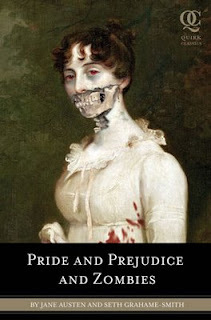 I think that zombie Pride and Prejudice is the creepiest thing I have ever seen. But really. It's creepy. And I remember when I first read Pride and Prejudice. I thought it was super boring and I was just reading it for school UNTIL I got about halfway in, and then I was HOOKED FOR LIFE. I loved it. Once I got used to the language and smiled every time some young man was described as "amiable" or something, I loved it. And I fell in live with Pemberley and Mr. Darcy, just like Elizabeth did. And I was sad when it was over. And now I'm just rambling. Good bye. i think we should forcibly take a spring break. to england. yes? yes. good idea richards.